Worcester's twice-capped Wales flanker Andries Pretorius, 29, has been forced into retirement by a rare auto-immune condition. His club said the South African-born player has neuromyotonia - or Isaacs' Syndrome - which causes continuous muscle cramping. "I can't perform to the standard I know is required to push myself and my team-mates without hurting myself," he said. Pretorius made two Wales appearances on their June 2013 tour to Japan. 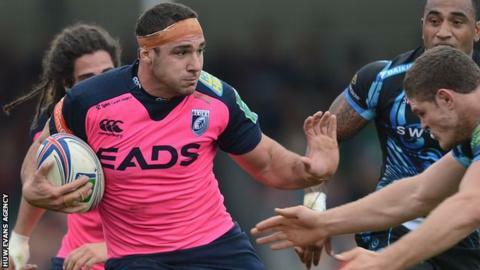 He had qualified to play for Wales on residency during a stint at Cardiff Blues, having been spotted by them while at Hartpury College in Gloucester. Pretorius was brought to the UK by current Wales age-group boss Allan Lewis while the latter was working at Hartpury College. A Worcester statement read: "The rarity of the disorder means that current treatments are not guaranteed to eliminate the symptoms. "After multiple bouts of different treatments were found to be ineffective, Pretorius was left with no option other than to retire to ensure he can continue to live as normal a life as possible." Worcester boss Dean Ryan signed Pretorius from Blues ahead of the 2014-15 season, but he never got the chance to make his Warriors debut. Ryan said: "Andries' disorder meant he was never able to play his part in the progression of this club on the pitch during his time here, but his day-to-day attitude was something which was a positive influence on other players. "The most important factor to consider is Andries' long-term health and we wish him the best of luck in the future."